Every couple has a unique dream of what makes the perfect wedding. Some want every person they’ve ever known to be there for a grand event and the exchange of vows. And some want the ceremony to be completely private – just between you, your spouse and the officiant. No matter what your idea of matrimonial perfection is, once you’re actually married, you’re likely to be ready to spread the news far and wide! Have a little fun with a sepia-toned (which you can create right in the Mixbook editor, by the way!) classic wedding photo announcement in an olde timey design. Friends and family members will get a kick out of your extra-extra-read-all-about-it format for spreading the news. With all the joyous excitement conveyed in the classic words scrawled across the back of the matrimonial getaway car, Mixbook’s Photo-Strip wedding announcement sends a clear message. You’re headed for happily ever after, so step on it! There’s no mistaking your message of post-marital bliss with the Modern Plaque card from Mixbook. Simply select one great photo from your big (or small, but no less significant) day to feature on the front. Friends and family will adore a memento from the joyous occasion. Mixbook’s Mod Modern Stripes wedding announcement is simple and classic, sending a clear message of a strong union. With its modern square format and cool blue and gray palette, it’s the perfect way to showcase a gorgeous black-and-white wedding photo. 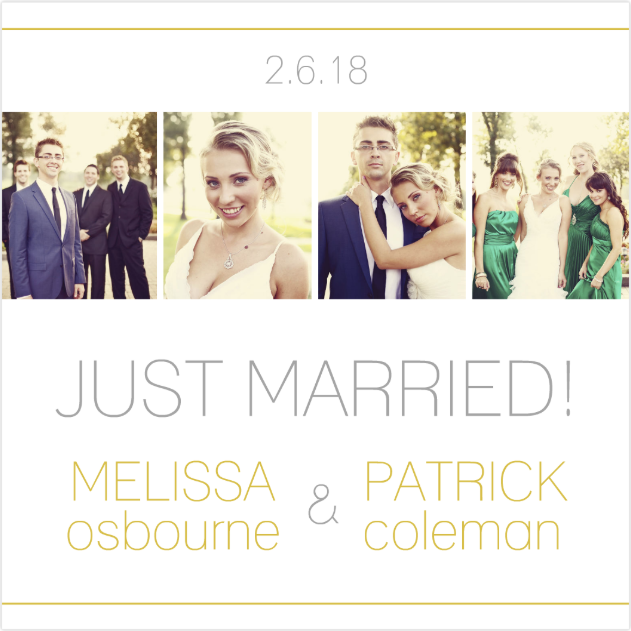 Mr. and Mrs. Pictures If you have a series of gorgeous photos to showcase, Mixbook’s Mr. and Mrs. Mod Collage is a great wedding announcement template to use. With simple, crisp typography in black on a white background, this simple collage sets off three photos from the wedding beautifully. Whether the bride and groom send the news around or it comes from another family member, custom wedding announcements can be sent to friends, family members, colleagues and clients. A wedding announcement is also ideal to send out to friends and family members who couldn’t make the wedding celebration either because they were too ill to attend the wedding, or because you chose to have a destination wedding with coordinates too far flung for some guests. Standard etiquette for wedding announcements dictates that they go in the mail the day after the wedding, but they may be sent up to several months later. No matter when they go out, everyone will love to display your gorgeous wedding announcement front and center on a mantel or on the fridge. After all, the next best thing to actually being present on your wedding day is catching a glimpse of your unbridled joy – and getting a sense for your style as a couple. Happy Mixbooking! Have fun getting the word out!